The speech is unsparing in its depiction of the GOP candidate as a would-be demagogue. The Republican party has actually nominated for president an irresponsible, unrealistic, naive, petulant, childish, vindictive, prejudiced, bigoted, racist, Islamophobic, anti-Semitic, misogynistic, fascistic, authoritarian, insensitive, erratic, disturbed, irrational, inhuman individual named Donald John Trump. This is madness. Any questions? Here, for comparison, is the editorial as it originally appeared. And, in the interest of completeness, here is some unadulterated footage of Olbermann’s character in action on BoJack Horseman. 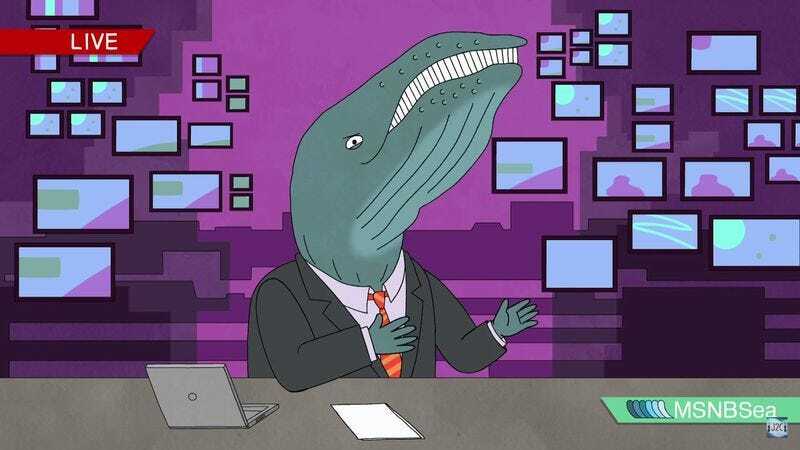 In this case, his character is interviewing Patton Oswalt’s Neal McBeal during the “BoJack Hates The Troops” episode from 2014.